The dictatorship of art! This is what German artist Jonathan Meese has been pleading for in his performances over the last couple of years. Enough with the ‘societalization’ and democratization of art in a desperate attempt to legitimate it. Things are precisely the opposite: society and democracy owe their legitimacy to art, and thus need to be ‘artified’. Meese’s plea for imposing a dictatorship of art is expressed in an oeuvre of exuberant paintings that combine personal hieroglyphs and collages, installations, sculptures made out of a variety of materials, but especially a series of ecstatic performances. These tempestuous performances with music and video loops can best be described as neo-expressionist, hypnotizing and even self-debasing epics of an anti-hero. With his quasi-fascist and anti-humanist conception of art, Meese can count on a lot of sympathy within contemporary art circles. The reason for this is no doubt the ever heavier pressure on artists to create a niche for themselves within a broader cultural programme based on values such as democracy and participation. With this, the traditional authority and autonomy of art is more then ever under threat. In this essay we show how Meese follows in the footsteps of contemporary radical philosophers such as Jacques Rancière, Slavoj Žižek and Alain Badiou, who also enjoy a lot of popularity among the current artistic avant-garde. We show that, as opposed to Meese’s supposed fascism, a more fitting answer to the dominance of the current paradigm of culture lies in exposing the dictatorial and fascist elements of this paradigm itself. 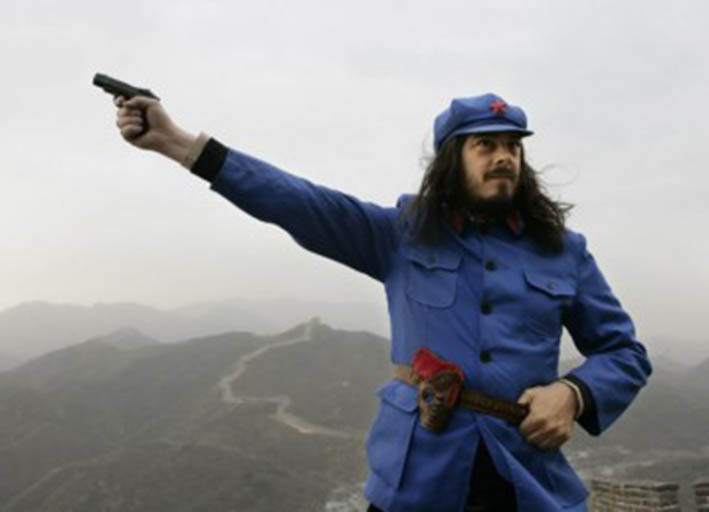 Or still: to be really credible, Jonathan Meese is not fascist enough. Early in the twenty-first Century, the notion of popular culture seems to have established itself once and for all as the dominant paradigm with regards to the arts. Among policymakers as well as the people, the consensus is that art needs to have a broad support by society. From the contemporary artist it is expected that she fascinates herself for the societal context in which she lives, involves as many parties as possible in the artistic production process, strikes the right cord with his art and knows how to choose the appropriate platforms to interpellate and mobilize certain target groups. The artist, moreover, should not regard himself as the possessor of an exclusive expertise but, on the contrary, always question his own authority and authorship and work together with outsiders and laymen. While in the second half of the twentieth Century a though battle raged between the advocates of high art and those of popular culture, today this battle has been settled for good. Participation, democratization and social integration are terms and criteria that are now firmly rooted in art practice. They dominate both policy documents on art as well as the discourse of artists and curators. However, this doesn’t mean that with the hegemony of popular culture, high art has been liquidated for good. The latter has rather been given an own niche within the paradigm of culture, from which it is enlisted frequently, along with other forms of cultural production such as design and architecture, to reproduce and legitimize liberal democracy. Contemporary art is, for instance, fully recognized and deployed as a soft yet effective force for reviving the local economy, the renewal of neighbourhoods or the controlled tackling of sensitive social and cultural issues. In other words, even if art is asked to mainly ‘do its own thing’, it doesn’t escape the influence of the dominant normative framework of social engagement and relevance. One could see this as the price high art has to pay for conserving its traditional privileges in a new era. Both the artist and its activities and products are more and more robbed of their traditional aura, autonomy and authority. Within the new paradigm everybody and everything can and is allowed to be art. It was to be predicted that sooner or later there would come a fierce reaction from the part of artists. In the German artist Jonathan Meese, the aggrieved artist population has today found a heroic advocate of its age-old rights and privileges. Especially the conception of art which Meese has been propagating in his eccentric way, under the slogan ‘the dictatorship of art’, must give a much-needed shot in the arm for the many discontented artists. His vision of art offers them an empathic manifesto to take on the dominant paradigm of culture. Meese propagated his conception of art recently during a performance in Amsterdam’s Rietveld Academy. We see Meese, a forty-year old with long hair, mustache, dark sunglasses and a long black leather jacket, pacing up and down a catwalk, while rattling off his manifesto guru-style in English with a heavy German accent. The Q&A session afterwards is merely an opportunity for Meese to further ram his vision down the throats of a somewhat perplexed audience. In his performances, Meese does his own thing in quasi-autistic fashion, without worrying about interacting with the audience, let alone the latter’s response. It is no coincidence that Meese stages his conception of art precisely in the current context and finds a relatively welcome audience for it. This is apart from the question as to whether he genuinely means what he says or merely puts up a play, as well as his actual popularity and influence within the art world (we shouldn’t make a mountain out of a foothill). In the first place, we recognize in Meese’s ‘the dictatorship of art‘ the good old notion of the autonomy of art, as summarized in the slogan ‘art is art’. For Meese art is its own measure, criterion and authority: art itself determines whether it is art or not, and why. The taste of ‘the people’ or even colleague-artist and experts doesn’t influence this whatsoever: art possesses its own truth, apart from ‘Man’ or society, so Meese maintains, and this truth proves itself. This autonomy even stretches so far that Meese bestows on art a will of its own: art does whatever it itself wants to do. The autonomy of art is thus not at all the autonomy of the artist: the latter is only a foot soldier or a privileged servant within the dictatorship of art. His or her only function is to assist art to do what it itself wants to do. He or she is only the temporary instrument of the superior and super-human power of art. In short, as if the high days of anti-humanism in the Sixties have never been over, Man – and all his ‘all too human’ feelings, ideas and aspirations – is degraded to a mere vehicle for the autonomous and superior entity of art. Even if human beings might think that it is they themselves who make art or posses or use it for their own purposes, in fact it is the other way round. It is hard to imagine a more radical inversion of the dominant paradigm of culture and its humanist-democratic disposition. At the same time, however, Meese maintains that everything is art. He considers the entire world as a theater or opera piece, talks about art as if it is a world view and defines art as the ‘leadership of a thing’. Meese thus combines an autonomous notion of art – such as that of ‘l’art pour l’art‘ – with a heteronomous notion – such as that of the historical avant-garde. He doesn’t just propagate the thesis that art is itself, but also that art is everything, including that which is not or beyond art in the strict sense of the terms. Art is thus not only its own authority, but also that of the entire world, yes, even the universe. With these views Meese is not alone. They are in line with the dominant climate of thought among radical-leftist defenders of contemporary art, mainly driven by post- or neo-Marxist philosophers such as Jacques Rancière, Alain Badiou and Slavoj Žižek. Meese’s double affirmation of the autonomy and heteronomy of art could for instance be seen as a variation on Rancière’s formula of the politics of art. Meese’s viewpoints also resonate well with Badou’s plea for an inhuman, non-democratic art, based on his general critique of democracy as an instrument of today’s neo-imperialism. Meese’s stress on the production of art as a duty that does not provide any pleasure to the artists or serves none of the latter’s interests – or worse even: the artist has to completely eradicate her own pride and self-worth and even humiliate herself – reminds strongly of the neo-Kantian Lacananism of Žižek. Meese’s claim that art necessitates the choosing of sides, that is to say, for or against art and nothing in between, blends well with the neo-existentialism of both Žižek and Badiou. In short, while Meese’s vision of art on the one hand goes against the current of the times because it takes on the ‘terror’ of the democratic-humanist culture paradigm, on the other hand it is also very timely. With his views Meese however doesn’t just share the same conceptual territory as anti-humanists, democracy-bashers and neo-communists like Žižek and Badiou. He also shares their provocative style: the way in which these thinkers diametrically oppose the dominant intellectual and societal climate and reverse all norms and values. So what to think of Meese’s plea to reinstate the dictatorship of art at a time in which art is more than ever subjected to popularization and democratization? For an answer to this question we can start by looking more closely at the way in which Meese propagates his art vision. His performances are clearly characterized by a strong contradiction between form and content. While his vision of art stands for a fearless affirmation of art as an objective, superior force that dominates Man and the universe, his performances often come across as ludicrous, despite his enthusiasm. In the performance at the Rietveld Academy mentioned earlier, one can not only hear giggling in the audience, but also Meese’s voice itself betrays a certain humorous intent. One consequently does not get the impression that Meese totally effaces himself as a soldier or servant in function of a higher cause. On the contrary, his own subjective idiosyncracies – his guru-like appearance, the contrast between his yuppie-like Adidas uniform and his archaic, Gothic hear style – prevail over his message. Even if one tries one’s best to follow Meese in his vision, sooner or later the question pops up whether it isn’t a very ironic twist of fate that Art – as the ruling force of the universe – has chosen a miserable human being like Meese – who himself admits to only want to sleep and vegetate in his bath tub – to propagate its total revolution among earth’s population. Or, as a blogger puts it: “his eyes are too friendly. Perhaps he would have been more successful as a wrestler”. The effect of all this is that Meese’s work is more about Meese himself qua person than about his art vision, as Claire Bishop puts it. She therefore characterizes Meese’s performances in terms of a ‘subjective blitzkrieg’. The effectivity of Meese’s plea for the supremacy of art is thus severely restricted by the following performative paradox: the plea for eliminating every subjectivity and humanity in art is subverted by the all too subjective and human way in which the plea is put forward. One could of course say that precisely this contrast between Meese qua person and the latter’s vision expresses most forcefully the radical split between art – as an a-subjective, infinite and superior entity -and the artist – as a finite, inferior creature. The same contrast is commonly applied in Hollywood movies in which a miserable, ridiculous individual is chosen by a superhuman force to execute an important and noble mission. The entire plot is then built around the split between the individual as finite being and the individual as servant of the infinite. Think of movies such as Evan Almighty or The Life of Brian. This contrast is mostly used for its comic effect as the chosen individuals do everything in their powers to escape their lofty mission. This internal struggle of the protagonist thus affirms the dominant humanist consensus on the unacceptability of human offers for higher causes. It affirms a view of man as a weak, egotistical animal from whom it cannot be demanded to sacrifice his life for anything but her own interests and desires, rather than depict the worthiness of such self-sacrifice in function of a higher calling. The appropriate response to the knee-jerk criticism of Meese for his flirting with fascism is thus rather that he is not fascist enough. The fact that Meese likes to do the Hitler salute comes across as a personal, ironic joke (comparable to the flirting with Hitler by fashion designer John Galliano) in light of his refusal to efface himself as a person in function of a greater cause: in this case not that of the Nation or Race, but that of Art. IT’S THE DICTATORSHIP OF CULTURE, STUPID! But also Meese’s art vision itself should be considered critically. In today’s conditions, it is all too easy to again plead for an uncompromising return to the high days of Art (with a capital ‘A’) as against culture (with a small ‘c’). Such a plea is supposed to force the current paradigm of culture to contemplation and to assume a more modest, self-conscious and self-critical position. It is quite unlikely, however, that this paradigm will feel called to do so in confrontation with its absolute, complete opposite. It is more likely that it will feel itself strengthened in its conviction of the necessity of the democratization and humanization of art. In this sense, Meese’s art vision is still too hysteric: it adopts the rather obvious position to affirm everything which the present order denies. Meese discards everything the paradigm of culture stands for: horizontality (versus transcendence), democracy (versus dictatorship), the all too human (versus the superhuman) and so on. This reversal of all values may well be meant as a provocation, still, it is too transparent to effectively realize this goal. Above all, Meese’s art vision is a good example of what Isaiah Berlin called the ‘seduction of totalitarianism’. This lure consists in pleading, in times of democratic monotony, for values opposite to those of democracy: anti-individualism, purity, revolution, transcendence, etc. Here also, Meese’s work can be seen in line with philosophers such as Badiou but especially Žižek, who unapologetically flirts with Stalinism. For sure: there is nothing wrong in itself with re-affirming totalitarian and authoritarian visions within the current climate. The crucial question however is which form of totalitarianism artists should encourage or taken on themselves. As a commentator remarks with regards to Meese’s work: “fascism is unlikely to be found in the most obvious places – under a fascist salute, for instance…”, it is rather so that: “… today’s most dangerous fascism is rather to be found in harmless-sounding things: the things we all do, the things we all think, the things we all believe in, the wars and environmental damage we cause as a result of all doing, thinking, feeling, wearing, watching and consuming the same (mostly idiotic and super-bland) things”. It is the task of the artist to affirm this predominant, socially sanctioned fascism and not its outmoded and universally condemned counterpart. Artists have to stage the underlying, inherent and often invisible fascism of the paradigm of culture itself. Think of the ways in which participation in culture often serves as an instrument for narrow nationalistic agenda’s (e.g. for creating regional and national identities), the way in which the ‘inclusive’ character of culture often serves the interests of a narrow political or financial elite, how it legitimates the fascism of ‘the man in the street’ or how it is used to subtly defuse and diffuse dissident voices in society within the general consensus. Enacting these fascist components of the paradigm of culture, which actually exist at its surface but still mostly remain invisible, is a much more effective strategy for disrupting it than the anachronistic and hysteric staging of its predecessor. It demands of the artist to be truly fascist, rather than staging it in carnivalesque fashion. Essay ‘Why contemporary artists are not fascist enough’ published in: Marc Léger (ed.). The Idea of the Avant Garde – And What It Means Today. 2014. Manchester: Manchester University Press. 196-200. This performance took place on 27-9-2010, the highlights of it can be found on youtube.com. For the accompanying manifesto (entitled: ‘Erzamsterdammanifest’) see http://www.rietveldacademie.nl. Also see the interview with Meese by Nicolai Hartvig (26-1-2011), ‘Artist Jonathan Meese on why democracy is finished and why Koons is not King’, http://www.artinfo.com. See Rancière, Jacques (2004), Malaise dans l’esthétique, Parijs: Galilée. See Badiou, Alain (2006), ‘Third Sketch of a Manifesto of Affirmationist Art’, In: Idem, Polemics, London & New York: Verso. Think of art critic Claire Bishop’s characterization of Meese’s performances in terms of a ‘Teutonic abjectness’. See Bishop (3-1-2006), ‘Performance anxiety’, http://artforum.com. Interview with Meese by Nicolai Hartvig (26-1-2011), ‘Artist Jonathan Meese on why democracy is finished and why Koons is not King’, http://www.artinfo.com. Imomus (29-7-2007), ‘Click opera – Is Jonathan Meese a fascist?’, http://imomus.livejournal.com. Claire Bishop (3-1-2006), ‘Performance anxiety’, http://www.artinfo.com. SeeImomus (29-7-2007), ‘Click opera – Is Jonathan Meese a fascist?’, http://imomus.livejournal.com and Diez, George (19/07/2007), ‘Why German artists should keep their hands off Hitler’, http://signandsight.com. See George, Diez (19/07/2007), ‘Why German artists should keep their hands off Hitler’, http://signandsight.com. Imomus (29-7-2007), ‘Is Jonathan Meese a fascist?’, http://imomus.livejournal.com.